All contents are subject to change depending on the season. ４．Seasonal Dishes, please refer the menu of the seasonal food. 10% of gratuity will be added to the price shown above. Original Kaiseki All contents are subject to change depending on the season. ２．Seasonal Dishes, please refer the menu of the seasonal food. Meaning: Your orders have been told to the kitchen. They will be served soon, please have something little for a while. 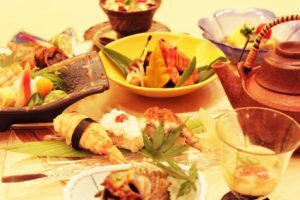 It is said “Japanese Cuisines are Based on Seafood”. What represents Japanese Cuisine is Having Raw Seafood. Decollate more than 3 kinds of boiled food in one dish. Each food is cooked separately to keep the natural taste of each food. This cooking style of Nimono is often seen especially in Kansai (west) area of Japan. 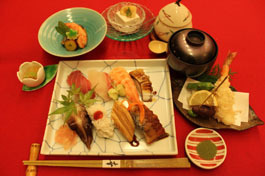 In Japanese Cuisine, it is mainly Fish. The amount of heat applied, the usage of skewers, the order of cooking differ depending on each food and it is very important fact to maximize the joy of tastes. In Kaiseki (see the reference below), Agemoto is usually a combination of a sea bream, a sillaginoid, a scorpion fish, a prawn, and, or, a conger pike, and some seasonal vegetables. The dish served as a substitute of one dish from the main structural elements of Japanese Cuisine, which is called “Ichijiru-Sansai (see the reference below)”. Mushimono is heated by steam. The best thing is steam never let the good things flow out from the food during the cooking process. Su-no-mono not only improves your appetite but also washes your mouth and recovers your fatigue. It is served to refresh your mouth before eating rice. 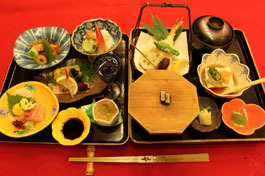 In Kaiseki, Gohan, Suimono, and Kounomono are served after guests enjoyed various dishes with alcoholic drinks. Last dish literally means that this is the end of the course. Generally, seasonal fruits are served for dessert. Sometimes, not only fruits but also Japanese snacks are served to refresh your mouth. The start of serving fruits is not so long time ago, and it is an extra cuisine. There are two kinds of Kaiseki, both of which are from the same root. One is served at parties and alcohol drinking places, the other one is served at tea ceremonies. Sakizuke (Appetizer), Wanmono (Soup), Mukozuke (Raw Seafood), Yakimono, Nimono, Last Dishes (based on Su-no-mono (or Aemono), Meal (Gohan, Last dish, Kounomono), Dessert (Fruits). 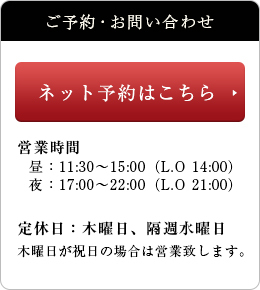 Generally, Kaiseki Course are served in order according to the list above with alcoholic drinks. Sometimes, Agemono, Mushimono, and Nabemono are served depending on the place and the season. Delicacies, food of delicate flavor (chinmi). Hassun : the second course, which sets the seasonal theme. Typically one kind of sushi and several smaller side dishes. Mukōzuke : a sliced dish of seasonal sashimi. Takiawase : vegetables served with meat, fish or tofu; the ingredients are simmered separately. Futamono : a “lidded dish”; typically a soup. Yakimono : (1) flame-grilled food (esp. fish); (2) earthenware, pottery, china. Su-zakana : a small dish used to clean the palate, such as vegetables in vinegar; vinegared appetizer. Hiyashi-bachi : served only in summer; chilled, lightly cooked vegetables. Naka-choko : another palate-cleanser; may be a light, acidic soup. Shiizakana : a substantial dish, such as a hot pot. Gohan : a rice dish made with seasonal ingredients. Kō no mono : seasonal pickled vegetables. Tome-wan : a miso-based or vegetable soup served with rice. Mizumono : a seasonal dessert; may be fruit, or cake. Copyright (C) 2018 幸（こう） All Rights Reserved.